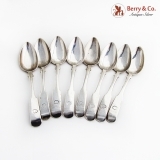 Fiddle Pattern Dessert Spoons Set of 8 813 Standard (13 Loth) Silver 1857 Helsinki, Finland. There is an engraved monogram "JA" on the front of the handles. These glorious spoons are 7" long. Total weight is 318.8 grams or 10.3 Ozs. Troy. 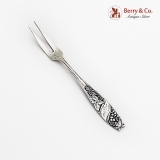 Grape Pattern Strawberry Fork 813 Standard Silver 1948, Finland. It has an engraved inscription "Tyyne" on the front of the handle as well as "1948" on back. This nice fork is 5" long and weighs 10 grams. Finnish 813 standard silver chambersticks, pair, in the Louis XVI style, maker′s mark FVL, Town mark for Helsinki, date marked or 1899. 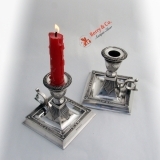 These very special square based chambersticks have fluted stems and cups, with the bases having milled edges with beaded borders with floral decorations. The removable bobeches have swirling beaded and fluted rims and are fully marked. Each chamberstick has a heavy ring handle with a spurred thumbpiece and straight bottom spur. The mounting sockets conform to the thumbpiece. Their condition is superb, with no problems of any kind. Weighing a total of 409 grams or 13.1 ozs. Troy, each chamberstick is 4 1/2" tall and 4 1/8" square. The soft, warm, original finish is present, with no buffing or machine polishing. The excellent original condition and clear, crisp detail, with no monograms, removals, repairs or alterations, make this an especially attractive offering.